Blurred or distorted migraine vision can be an early warning sign that an attack is on its way. 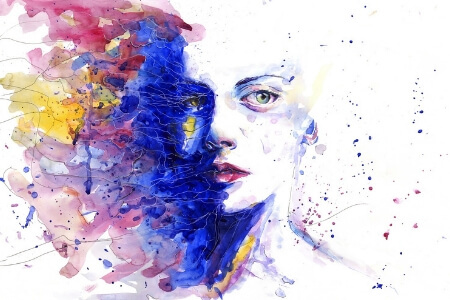 Pain free or not, visual migraine hallucinations can be scary. Symptoms like shimmering or flickering lights, blind spots and a moving expanding field of vision can be alarming at first. I often see the carpet moving like the ocean or small orange and black dots in the air. Sometimes it’s just like looking through Vaseline or broken glass. Other symptoms also include zigzag, wavy or jagged patterns and blind spots. 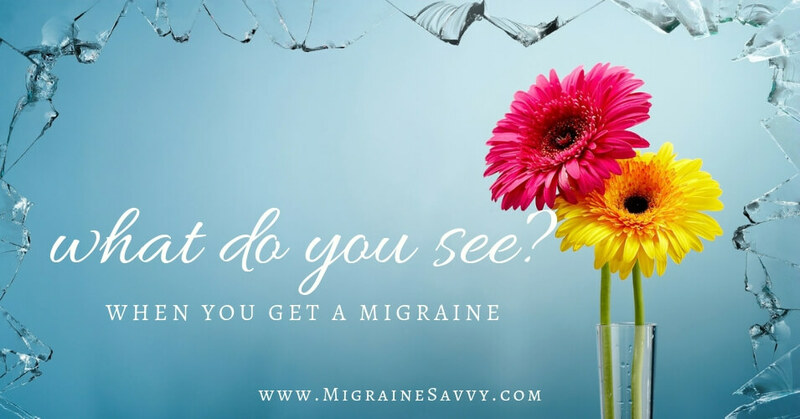 If you’d like to know more about how the visual system is involved, and what other visual disturbances you should be aware of, I’ve written all about that here - The 7 Visual Symptoms of Migraine Headaches You Should Know About. Visual disturbances accompany most migraines. They are often considered to be a part of the aura phase of migraine and typically last between 10 minutes and an hour. Typically! Approximately 20-30% of us get these attacks (migraine with aura) that are accompanied by visual dysfunction causing symptoms. These can be part of a migraine aura, but they don't have to lead to the pain phase of a migraine. 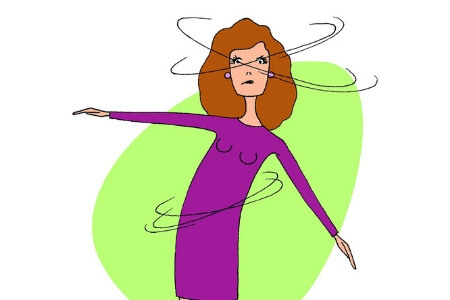 The aura has visual symptoms and typically appears about 15-20 minutes prior to the onset of the headache pain phase (the third phase of migraine). Although the symptoms can at times be frightening, they do not cause any long-term damage. Here are some cautions, precautions and some solutions for you to become aware of if you experience visual disturbances. 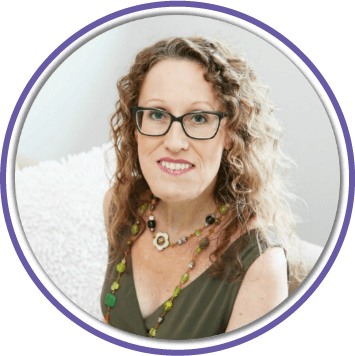 And then you can read my five steps for acute symptom management to help reduce debilitating symptoms. Distorted migraine vision does not start in the eyes. It originates in the brain causing visual symptoms because the visual cortex is effected. This is the part of our brain that is responsible for sight. 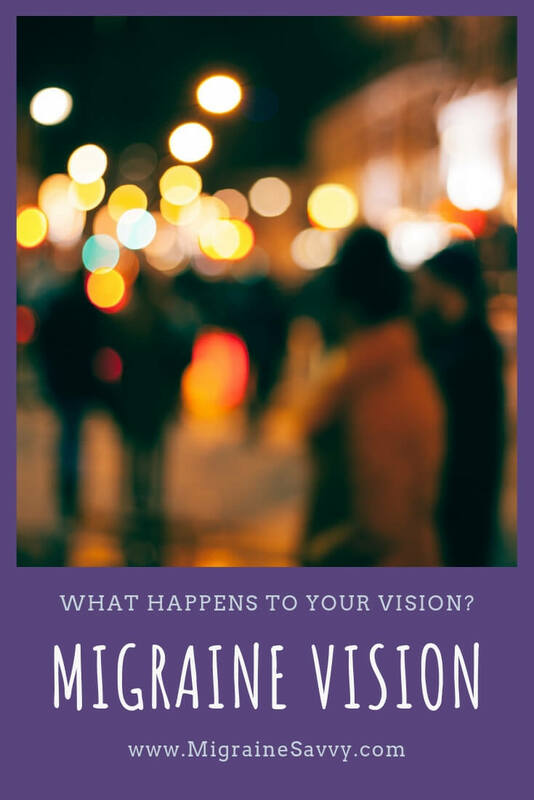 A word of warning: there is a higher risk of having permanent loss of vision and increased risk of stroke for us migraineurs with this type of aura symptom. One of the hallmarks of migraine is the all too familiar repetitive cycle of the chronic symptoms. The same symptoms happen over and over again for a period of many years. Blurry migraine vision is just one symptom that will reoccur. 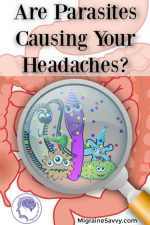 One of the cautions that should be taken seriously is to know your migraine pattern, your aura and typical symptoms. 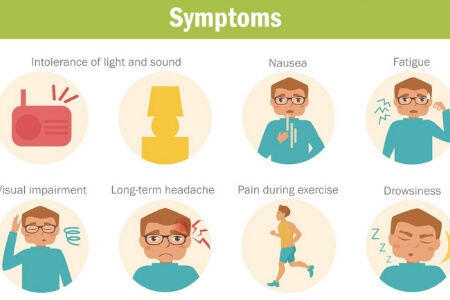 If there is a change in your usual visual symptoms that you experience, it could indicate something more serious and you should notify your physician as soon as possible. 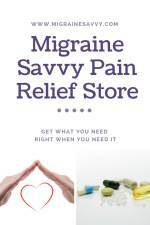 You might like to read my article on ways to treat eye migraine symptoms for more details on warning signs - How to Get Rid Of An Eye Migraine With These Key Acupuncture Points. If you are pregnant and typically have migraines or migraines with auras, you might be happy to know your migraines may improve. It has been reported that about 70% of women notice an improvement during pregnancy. 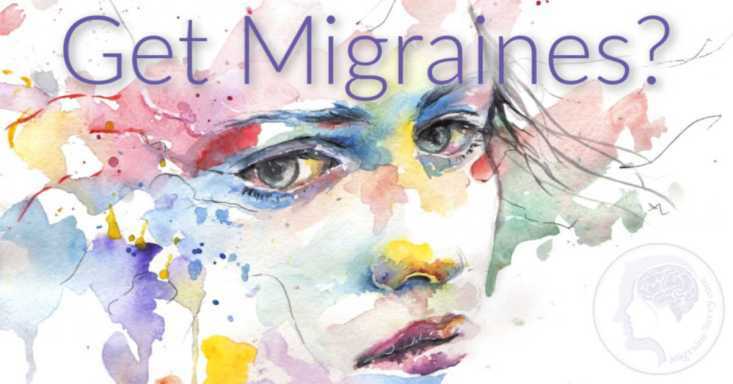 Hormonal migraines are so common. Nausea and vomiting, which often accompany pregnancy and migraines, should be treated. These can place stress on the unborn baby. Women should not take medication during pregnancy, however with migraines, the severe pain of the headache can cause the adrenaline level in the body to go up. This in turn can increase the unborn baby's heart rate and the mother's blood pressure. Some physicians will prescribe daily medication for pregnant mothers with this problem. In mild cases the typical vision changes last only a few minutes, but if you are driving, you should still pull off the road immediately for your own (and others) safety. The same goes with any instance where you might risk your safety at work while operating heavy equipment. Cautions: whilst driving or operating heavy machinery. Evaluate any safety risk. Know your triggers and practice preventive therapy. If you can decrease the frequency or severity of the migraines, then the visual problems should also decrease. Keep a regular routine, exercise regularly and attempt to reduce your emotional stress. Reducing glare is also important. Wearing migraine specific tinted lenses or polarized lenses could help immensely. Precautions: be proactive by protecting your eyes from stress, strain and glare. Whether accompanied by a headache or not, if your vision disturbance is severe, you can use the same type of treatments as for a full-blown migraine. This should help to decrease your disabling symptoms. Moderate to severe cases causing migraine vision problems may be best treated with medications. Always take your medicine with you if you are planning on travelling. The way your body reacts to your medication has the potential of changing over time, so if they appear to be becoming less effective, talk with your physician to come up with a treatment plan that could work better for your migraines and your migraine vision symptoms. Staying in touch with your doctor is very important. Solutions: rest and relaxation may be all you need if mild. If moderate to severe medications may be required. Work with your doctor and follow these steps to better symptom management. These visual distortions could mean anything and nothing. You need to see your doctor and get properly diagnosed. No pun intended! If you get no pain, then it might mean you just need to ride it out and rest while the episode passes in an hour or so. But if you get a lot of pain, you may need to consider taking medications. Of course this depends on how often you get the attacks. 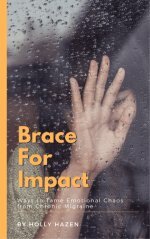 If it is effecting your work and lifestyle you will need to learn ways to manage it so you can continue creating a wondrous fulfilling life. Your doctor will perform eye tests to ensure that there is nothing wrong with your eyes. Do not be concerned if there seems to be numerous tests, this will just be to rule out anything more serious. Most symptomatic migraine vision episodes last from twenty to thirty minutes and then they finish. I recommend taking action at the very start of the subtle sensations that are your early warning signs. Please don't ignore the clues your body is sending. So, if you are working or driving you will have to act quickly and pull over to the side of the road or stop working. The first few attacks can be scary, but eventually you will be able to learn your own patterns and will know what to do. The thing about migraine vision, unfortunately, is that it's repetitive. I hate to be the bearer of bad news, but I would rather you know this right up front so you can be prepared. The symptom(s) will reoccur again and again for years to come. The good news is that you will get another chance to try something different and find what is most effective. And you will learn to manage this condition. If your visual hallucinations are an indication of an impending attack, like they are for me, this would be a good time to take your medications. Taking your meds at your earliest warning signal will give you the best chance at aborting the attack. 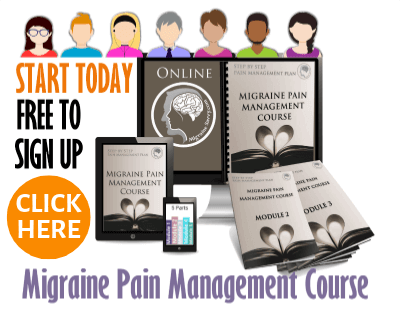 Develop a migraine management plan with your doctor and plan ahead. For example, I'd use: sensations, take meds, tell boss, go to safe space, relax. 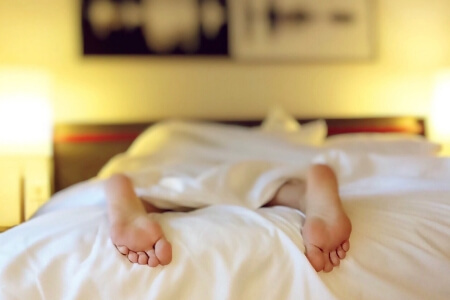 On a simpler pain-free practical level, you just need to take action and go find somewhere to lay down or rest. Plan ahead for some places to pull over and stop on a long haul if you have regular attacks. Have a safe place at work that you can escape to, or just go and lay down in your car. Keep a spare hand towel or hat to help keep out the light. To share one example, when I was studying I would book a consulting room to go a lay down in at lunch time to meditate and rest my eyes. The bright fluorescent lights were a trigger for me. But it made me feel safe and enabled me to continue studying. One of the best things to do to just relax is to become aware of your breathing. Counting to 4 and pausing at the top of the inhale and the bottom of the exhale will calm you down. So inhale and count to 4, pause 1 -2 and exhale count to 6 and pause for 1 – 2. I can highly recommend Dr. Weil’s Breathing CD. In addition to the above 5 steps, I would also recommend just being proactive and protecting your eyes.